The drive (without any stops) to Key West, the last of the keys, takes roughly 3.5 hours. However, as a large part of the fun in this road trip is the road itself, I highly recommend stopping in some of the keys, looking out at the views, enjoying the beaches and touring the small towns along the way. Next to each of the impressive bridges linking the islands is an area where you can park and look at the view. Along the islands are several ocean reserves which are great for diving. One particularly well known one is John Pennecamp Coral Reef State Park, at the north of Key Largo. Twice a day, glass-bottom boats leave the reef for a two and a half hour trip. There are aquariums and screenings about the creatures of the reef in the park’s visitor centre. 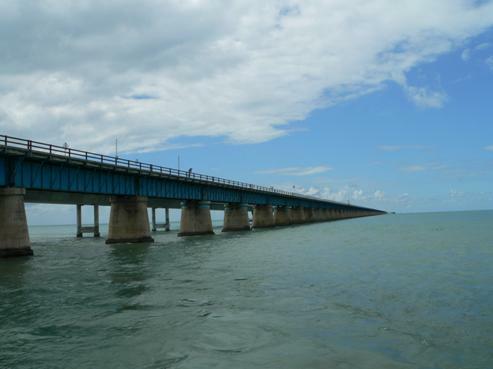 Another great reserve is the Looe Key Marine Sanctuary, which is south of the longest of the bridges: The Seven Mile Bridge. Even people who don’t like diving will enjoy the beautiful beaches of golden sand and coconut trees. Dolphin lovers who have not had their fill of them in Orlando should stop on the way to visit Islamorada and Marathon City, where dolphin shows are held. Key West is the southernmost city in continental USA. It is a lovely holiday town with a subtropical climate and several historical sites, such as: President Truman’s vacation home, Hemmingway’s house, the lighthouse, and others. The best way to see the city is in the Conch Tour Trains, which leave (very often) for a 90-minute tour of 22km through the old and new quarters of the city and between any important buildings. The city has several marinas which offer all kinds of boat tours – fishing, diving, touring, glass-bottom boats, and tours for viewing the sunset, which is known to be especially beautiful here. Information about Key West and the rest of the Florida Keys: thefloridakeys.com .